::Want to blog about this challenge? If you’re blogging through this challenge with me, be sure to leave your link to your direct post on linky below. 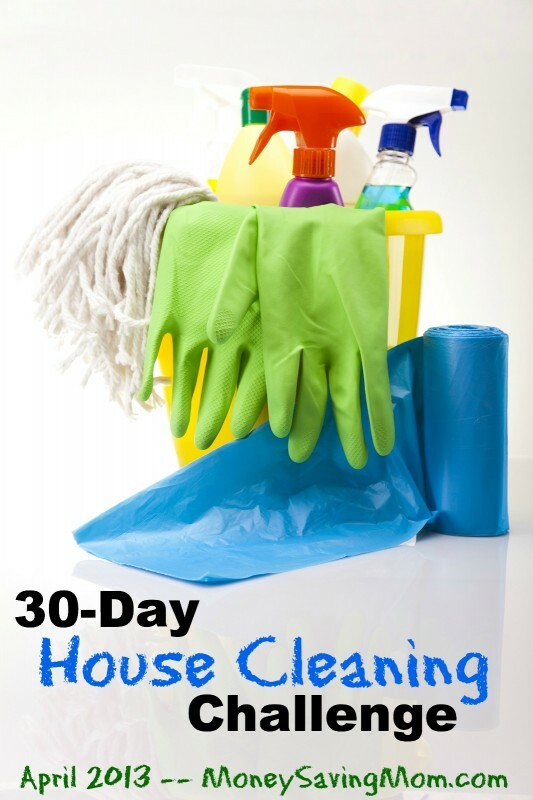 Plus, if you’d like to post your daily posts to the 30-Day House Cleaning Challenge Pinterest Group, just shoot me an email (moneysavingmom @ gmail dot com) and I’ll invite you. I’ve been watching the challenge but haven’t participated until today. When I saw today’s task was deep cleaning a bedroom, I knew this was just the challenge I needed. The before pictures are embarrassing, but I’m really happy with the way the room looks now. Thanks for the inspiration! Yay! I’m so glad you joined us today! Joined you today too:) Started by taking a picture of the closet, and cleaned it out… Next thing I knew I was cleaning the rest of the room -and failed to take a before picture!!! Dang it, it was worse than the closet!!! 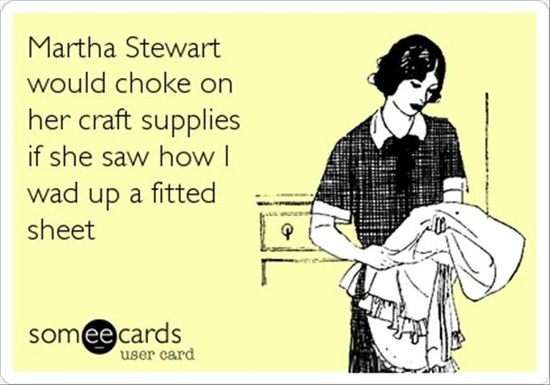 (BTW, your Martha Stewart cartoon was priceless, I referred to HER for tips on how to deal with sheets in the middle of the process! – tuck the flat, fitted and one of the pillow cases inside the other pillow case to hold everything together and it hides all the mess!) The room looks amazing now, and I haven’t even finished clearing the dresser! I love putting the sheets in the pillow case too. It sure makes it easier to find a set. I fold the sheet in half lenghtwise. On each end I tuck one corner pocket into the other. Then, I fold the sheet in half again, and again, tuck one corner pocket into the other. Now you should have only one corner pocket with all four corner pockets tucked inside each other. Now, fold the short and long ends that meet at the pockets straight, forming a rectangle shape. Fold in half again, concealing the folded edges, creating a smaller rectangle shape. Done! 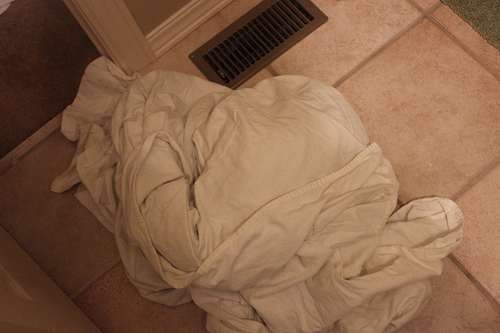 Place the folded flat sheet on top, and the folded pillow cases on top of that. FYI, I find it easier to fold the fitted sheet on top of the bed. I fold my sheets the same way! I did a little pictoral walk-through of the process on my blog a couple weeks ago…hope it is a help! Folding those fitted sheets can really be SO easy! Thanks for the link up. Hope you have a nice weekend. What a day!! With hubby home we knocked out so many things that have just needed his time to get done (I’m not handy with a hammer) And on top of it I went through my dresser and closet and have my throw away, consign, and garage sale piles. 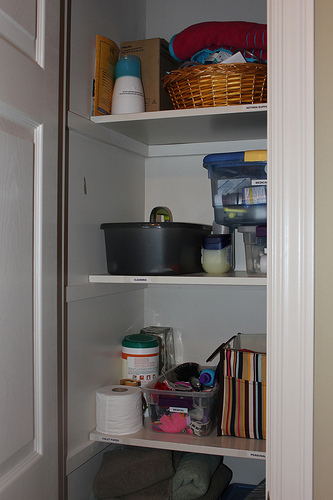 Then I was able to do the linen closet. That wasn’t so bad but my daughter’s been out of a crib since Dec. and I didn’t realize the crib sheets and pads were still in the closet so got to take those out. And tonight while my husband did the night time routine I was able to go through the twins dressers and see if there was any outgrown clothes. As much as I’d love to switch over seasons I can’t yet. We live in MN. and just got more snow yesterday!!!! All the snow finally melted last weekend and it was nice out and then twice this week we get snow! So much for washing all the winter gear last weekend. This is a little unusual for even MN. Hopefully I will get more purging done this weekend. I live in MN too – I keep wanting to wash and put away winter gear, but winter keeps coming back! No cleaning for me today, it was my husband’s only day off this week, and no more for another two weeks, so we spent the day running errands and just having a nice, uneventful day together. I am glad I’m not the only one who has trouble with folding the fitted sheet. 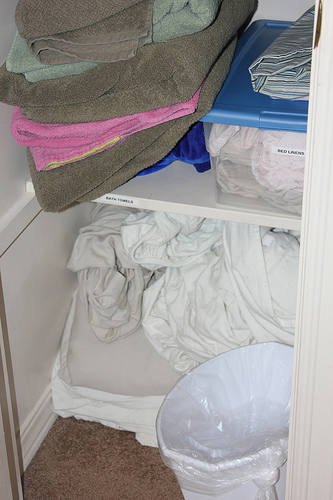 I store my fitted, pillowcase and flat sheet inside of the other pillowcase to make them look better in the linen closet. Great job on your summit presentation tonight Crystal! Aw, thanks for your kind encouragement! Day #12 – Done! Yay for a straightened up closet! Winter clothes are out and spring/summer are in. Love opening those cleaned out closets and I’m loving this challenge! We went through a section of our basement (mostly storage) to gather up stuff for our yard sale in a few weeks! Exhausting! But it will pay off! I took on way too much at the beginning of the month, and then became really overwhelmed, but I’m back on track, and planning to catch up! Thinks for such a great challenge! I stuff sheet sets into the pillowcase. It’s not pretty but I can find the whole set easily that way. Crystal, here’s my favorite way to fold sheets. I fold them into “packages.” First you take the flat sheet and fold it into a neat square, then you neatly fold the pillow cases. You then quickly fold the fitted sheet the best you can. Now you put together your “package.” You tuck your fitted sheet and pillow cases into the next to last fold of your flat sheet , then fold it over the top. The fun part is neatly placing your sheet “package” on the shelf with the folded edge out. 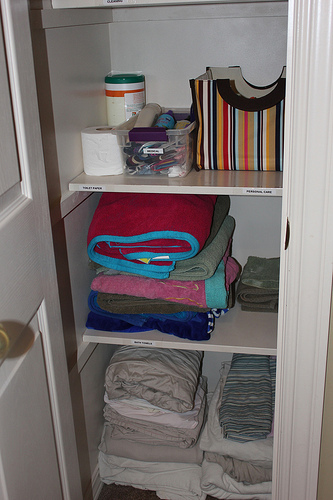 The linen closet looks great like this! That is EXACTLY what I do! Then it doesn’t matter what the fitted sheet looks like all folded! I’m a little late to this post. I decided to go grocery shopping after I got home form work last night and I fell a sleep before I even got to motivation to get started on this project. 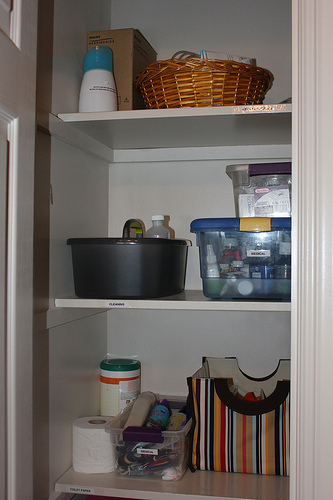 I woke up this morning (Saturday) with renewed energy and I organized my household pantry closet! YAY! It was much needed! I know we are suppose to take the weekends off, but it just works much better with my schedule to do housework on the weekends so I am going to try to tackle the other two challenges this weekend! I’m on a roll! Last night, I completed my grocery shopping, popped into church to chat with Pastor, and made a pot of vegetable soup. I woke early (at 0400) and so far this morning, I’ve gotten the pantry, storage closet, linen closet, foyer closet, both bedroom closets and both bathroom vanities cleaned out and organized, as well as my desk. Changed the furnace filter and have both the dishwasher and washing machine going through their monthly upkeep clean. Bills are paid, 2 letters written, and I purchased a Christmas gift (FREE) utilizing my Reward Zone points which I earned via Facebook. I’m heading for a second mug of coffee and onto the master bedroom for a deep clean and then the living room. Then, I’ll take a short nap before going out for a movie with friends. Crystal, you and the comments from your other readers have motivated me to complete as much as I this weekend. Thanks for this series of posts. Have a great weekend everyone! I worked in housekeeping at a camp/conference center for several years, and when they had retreats on weekends, I got pretty good at folding sheet sets. It’s fun if you get a system figured out (and if you have just a touch of OCD). But unless you are doing it that much (200 per week or so), it’s probably not that important! Keeping the sheet sets together though, either all in the pillowcase, or in a package of some sort is pretty helpful! I don’t have a linen closet in my house but I have several walk in closets so I should have tackled one of those. Instead I worked on the vacuuming and sweeping. This week had some family issues and business things that came up so I had to catchup on other chores. Love this challenge and love seeing everyone’s achievements. I didn’t think I did much cleaning this weekend, until I sat and started typing it out. I started a huge project in the house, so I had to surface clean afterwards. Thanks for the challenge, I am loving my new-found motivation! Yay and way to go! I’m pretty enthused about what I was able to get accomplished. I cleaned out my kids’ closet in their room, which always seems to accumulate stuff. Then I tackled our messy basement storage/work bench area, which frankly hadn’t been really seriously worked on for longer than I’d like to admit. It took a long time, but now it looks so much better and I feel so much better! I remembered to take “before and after” photos too. I got a ton of stuff to give away from this, so I’ll be making a run to Goodwill soon. Taking pictures of the mess and then taking pictures of the clean product really makes you stop and appreciate a cleaner home. Thanks so much for this challenge (the 30 day cleaning challenge in general). Will be keeping an eye on your website for future challenges…they are very helpful!